I am a Computer Science major at Columbia University (SEAS '19). My current interests range from deep learning to audio engineering, and I'm constantly looking for more things to do. Ongoing multi-year research on motivating image discovery and interpretability using deep learning features and a novelty discovery algorithm. (Submitted) S. Lu, K. L. Wagstaff, J. Cai, G. Doran, J. Lee, L. Mandrake, Y. Yue. "Improved Content-Based Image Classifiers for the PDS Image Atlas" 4th Planetary Data Workshop , 2019. 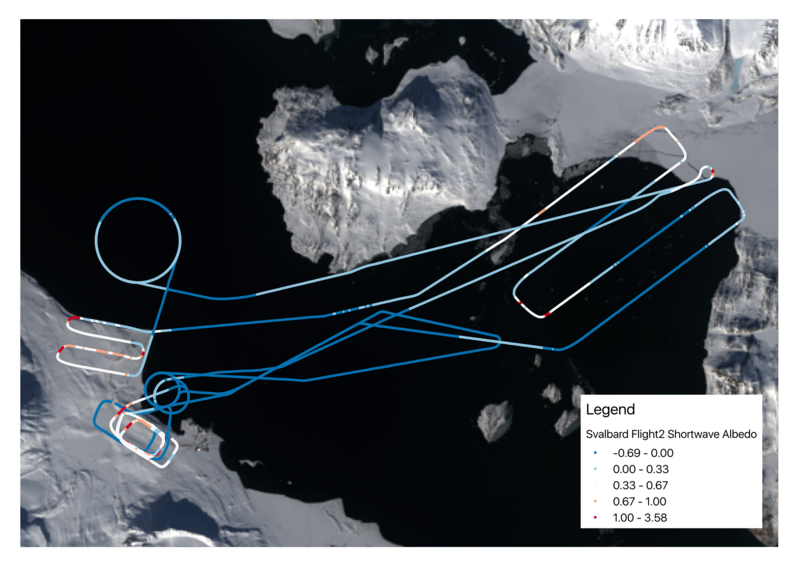 (In Preparation) Lee, Jake*, and Wagstaff, Kiri L.* "Visualizing Novel Image Content to Explain Image Discovery"
Analyzing shortwave and longwave radiation albedo data from a UAV flight over Svalbard, Greenland with MATLAB and generating a GIS visualization of it. Example [PNG]. University of Nevada, Las Vegas Computer Science Dept. Performed a survey of the bitcoin mining hardware market in hopes of predicting the future behavior of the hardware market as well as the bitcoin mining difficulty. Whitepaper available [PDF]. University of Nevada, Las Vegas Astrophysics Dept. Researched the behavior of high altitude balloons in the atmosphere, specifically on achieving neutral buoyancy without active controls. Discussed my findings in my "Extended Essay" requirement for the International Baccalaureate diploma. Available [PDF]. Columbia Social Entrepeneurship Group Tech: I am the founder and current director of CSEG Tech. We provide dedicated tech and data science services to social impact organizations, including nonprofits and social enterprises. We are currently doing great work for organizations that I am very proud of. 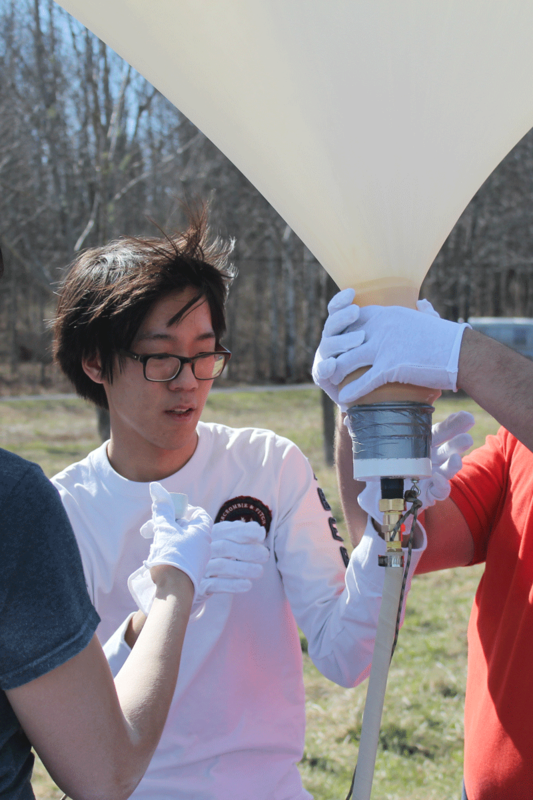 Columbia Space Initiative: As the High Altitude Balloons Mission Director, I lead a team of students to launch a balloon with scientific payloads to ~100,000ft. Our first launch in 2016 received a lot of media coverage by the school, and we are currently preparing for our second launch. Visit the mission page here. Columbia Makerspace: I am one of the Superusers, or a student volunteers, at the Makerspace. We provide various tools and materials, such as 3D printing and laser cutting, to students and faculty. I also consult on various projects that come through the space and assist other labs as necessary. Columbia Pops Orchestra: I am a cellist as well as the video producer for the Pops Orchestra. We play movie and video game soundtracks arranged by students. Columbia University Amateur Radio Club: The first collegiate HAM radio club in the world - I did some small maintenance and contacts during my freshman year. Electrical Engineering: CS is fun, but CS with hardware is also fun. I know enough to do arduino projects and basic circuits. DIY/Making: I can only stare at a laptop screen for so long. I try to make various gadgets and help with others' projects at the Columbia Makerspace. I'll have a project page/blog eventually. Aerospace: I launched several high altitude balloons in high school, and I've continued to do so at the Columbia Space Initiative. I've also been exposed to a lot of related topics during my internships at JPL. I was fortunate enough to watch a Falcon 9 launch from Vandenberg AFB, and it was amazing. Photography: My rig is a Panasonic GH4 mirrorless and a 18-35mm f/2.8. I do event and project photography for clubs and social media, but I'm trying to do more street photography. Videography: I have a couple filmmaker friends on campus, so I try to help out on set. I also do video recordings for visiting speakers, panel events and Columbia Pops concerts. Audio Engineering: This started when Columbia Pops needed audio recordings. Conductors/arrangers were recording on their cellphones and it sounded terrible. I bought a Blue Yeti initially, but I now own a Scarlett 2i2 and a pair of Line Audio CM3s. They sound great. I also do MIDIs of orchestral music so that the conductors can hear what their arrangements sound like before rehearsal (EW Hollywood series). I also hold the boom mic for my filmmaker friends whenever they need an extra hand; you see can some of the videos I've been credited in on my vimeo page. Gaming: I play CS:GO, TF2, Rocket League, GTAV, BF4/BF1, Overwatch, Shenzhen I/O, TIS-100 and RCT2. PC Building: I am currently on my second rig, and I've made a few rigs for my friends and random people on reddit. Here's a link to my current parts list. Drones: I've flown drones of various sizes, from a small toy drone to a 3DR octocopter. I'm hoping to learn drone videography soon. Music: I play the cello for Columbia Pops and I'm trying to practice piano more. Mechanical Keyboards: I currently own a Razer Blackwidow TE with Cherry Blues, but I'm looking for a Pok3r, Ducky or WASD 60% or 80% with Cherry Reds. HAM Radio: The HABs I launch use APRS trackers that send out GPS signals on 144.39, so I had to get a license. My callsign is KF7YAF.